SOCRATES, THE GREAT PHILOSOPHER, “COMES ALIVE” THROUGH MODERN TECHNOLOGY AND ADDRESSES A CALL TO THE GREAT LEADERS OF THEWORLD BY A LIVE-STREAMING BROADCAST. «UNIQUENESS OF THE GREEK LANGUAGE»! We have already sent the Book of the Results of the 9th Forum Humanitas to the Presidents of the United States, Russia and China and the Prime Ministers of Japan and Greece as well as the Pope, the Patriarch of Moscow and of all Russia, the Secretary General of the UN, the Director General of UNESCO and many other European and non-European political leaders and personalities. In the official letters we sent to the world leaders accompanying the Book of Results we emphasize the need for them to sign the MOTION FOR A RESOLUTION so that the Greek language is recognized as the second language, after the first national language of each country, in the cultivation of Letters, Arts and Science. 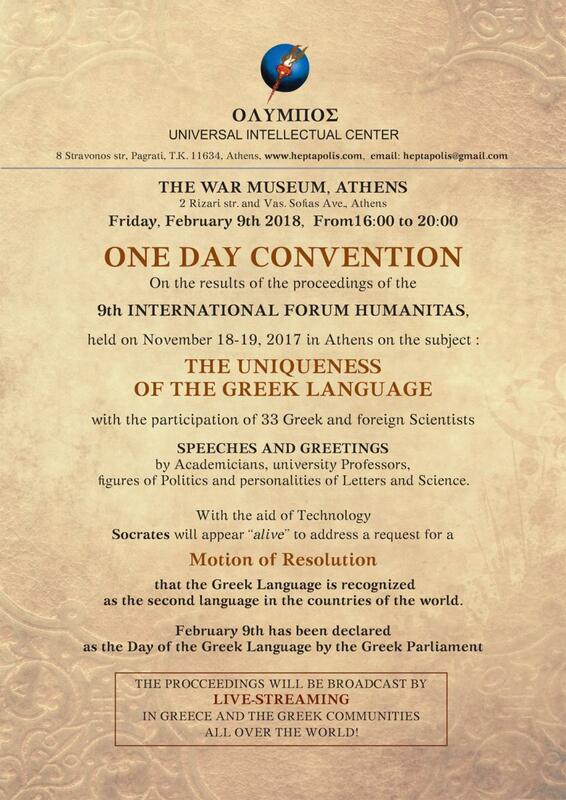 At the Convention of February 9th, a day which was declared the Day of the Greek Language by the Greek Parliament, will participate and speak many distinguished scientists from Greece and abroad. We wish to draw your attention to the fact that at the CONVENTION there will be a presentation of Socrates’ AVATAR, who, with the aid of modern Technology will appeal that our MOTION FOR A RESOLUTION is supported by the Leaders of the World. The proceedings of the CONVECTION can be watched in live-streaming from every country of the West and the East, by all the Greek communities all over the world. For any further information, please contact us at [email protected].